Faber heatkraft Chimneys Customer care details are provided for the customers to enquire about after sales service for products like Hoods/Chimneys, Hobs, built-in ovens, dish washes, exhaust fans and Induction cookers. Faber HeatKraft Chimneys Customer Service Number is given below for the customers to make use of services provided by Faber HeatKraft Chimneys Customer Support team. Below provided is the list of service centers of Faber heatkraft. Customers can get assistance related to faber heatkraft from these service centers. Name : M/s. Subhash Distributors Ltd. Address : No.76/1, Mission Road, (Below Adlabs). Area Name : Mission Road. Address : Address – B-77, Okhla Industrial Area, Phase-ii. Area Name : Okhla Industrial Area. Address : 22, Ramkrishna Road, Bardhaman Nursing Home, Bardhaman Town. Area Name : Bardhaman Town. The company provides warranty services to the products and to avail the warranty service customers should register their product within 30 days from the date of purchase. The warranty covers Parts like Motor, Rotor & Touch Button / Switch PCB. The life time warranty is valid only if the customers produce life time warranty bill/invoice. If the product is not registered within 30 days of purchase the warranty will be void. For trouble free Servicing Customers can enroll for Faber Cleaning Contract (FCC) by contacting the customer care. However, this service is not covered under warranty and charges may apply. For detailed information on life time warranty, please visit official website of the company. Faber India started its manufacturing operations from the year 1997.With the experience over the years, company offers innovative and comfortable featured products. Currently it holds 2000 retail counters all over India and distributes its products through its dealers. It is aimed at offering the best quality kitchen products by implementing the latest features like electronic controls, remote control, stainless steel or mirror glass, 3 velo LED lights etc.Collection Series, Sil-k Series, Sunzi Series, Decorative Isola, Decorative Series and Traditional Series is the product range of chimneys. Faber chimneys have advanced technological features like F – Light Generation, the Silence Key (SIL-K), High suction power, soft touch control and a triple layer baffle filter.The Silence Key reduces hood sound by 12db. Due to the presence of baffle filter the chimney can be cleaned easily. Hello really we are facing very problem with this chimmni’s . We complaint many times for the purpose of hub knobs but still we are not able to receive proper response from the company people. 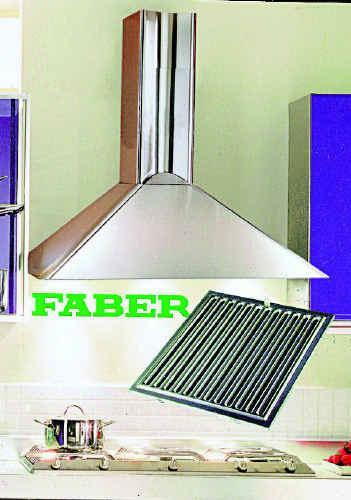 I bought a Faber Chimney 2 years back in satya suma marketers kurnool town . it is very useless shop in kurnool town..They don’t come up at the right time, instead we have to call them and ask to come and do the service. so any person don’t go to the shop to buy a a any product. Hai im raj from bangalore. I purchased a faber hob and chimney 13 months back. There was some issue with the burner lighter do I gave a complain, where I purchased the above products. Its almost 7 months up still no one has come to rectify the problem. They even dont ans my call. The shop is located in H.B.R LAYOUT BANGALORE. Its the worst after sales service and worst service back up from faber. I dont recommend any1 to buy any product from them.. thank u.. I purchased a Faber cristol laptop 3 years back and Probable one of the worst consumer durable product I have ever brought. Very Poor response from service guys. They dodge you several times before coming to your place. Worst Customer satisfaction I have ever seen. It is almost one month no one is bother about installing Faber chimney in Pune. I have called the service guy directly many times but got the same answer that Pipe is not available. I am not a happy customer. There is one service centre in bangalore called by a name- subhash.com. The service is horrible- please do not take service from that centre. They will never send anyone for service but will take the call and promise you many things. I bought a Faber Chimney 2 years back, it is completely useless. First it does not have a auto clean. It has to be cleaned every 2-3 days which is a very hectic process. In the name of Annual Maintenance they charge Rs.1600 and for 6 services a year. In this maintenance they do not do anything just the same superficial cleaning which we do at home then why should we call them and pay them for something we can do at home. They do not open the filters and clean it but the oil and soot collect in the filters so a superficial cleaning does not serve any purpose. Please do not spend your hard earned money for this useless product. This is to APPRECIATE the prompt response and efficient after sales service rendered by Faber Pune HQs & Bangalore Service Centre. My Motor after 6 Years became unserviceable. Called up the Pune HQs toll free number. They gave a registration number & promptly activated the Bangalore Service centre. The Inspection Serviceman after analysis took a photocopy of our Life Time Warranty Smart Card. He came back with the necessary Spare Motor within a reasonable time of 10 days. He promptly carried out the Servicing / replaced the motor / tested the system /and set up the Chimney in a fully working Condition. I Paid him the Service Charges for which he promptly gave the Bill. We Appreciate the Excellent After Sales Service done by Faber Representative Mr Abraham. He has brought a good name to Faber. Regards. K VISWANATHAN. i complained about my mars model chimney about to fall apart from the installed site. still no response after 5 days. kindly take care of customers desperate of emergency problems .wake up and attend immediately. have conscience, ur sales will collapse if ur service is like this. but it is such a company that the response may come when and how only God knows. We purchased a chimney model GLASSY 60 LTW SUNZI, model no1206019879 on 12th july 2012. Thus your Faber chimney is lying idle as a decorative piece in our kitchen for almost a month now!!!! if this is how you are going to deal with your customers then we are sorry to say . We may be forced to go back to your dealer give back your product and buy another companies chimney…. Further more we would blacklist your customer service and would never ever recommend it to our friends too…hopefully you would look in to this matter and take prompt action…. btw please do employ service men who have knowledge about what they are doing!!!! according to the installation book the distance from hob to chimney should be 60 to 75 cm. but your servicemen has marked it at 85 cm!!!! plus you should also clearly indicated before installing what should be done by the customer’s end too. Just hoping our grievance gets proper and prompt attention. I am Annadurai from Dindigul, Tamil Nadu, India. 2010.Suddenly got problem in motor fan which is no rotating. I had taken a yearly contract from faber for my chimney servicing and am really disappointed.I am really disappointed with this contract and in future I would try to avoid buying FABER products because of the poor service. I had purchased a Faber Chimney from Akbaralleys Departmental Stores , Chembur , Mumbai around 2 or 2.5 years back for Rs 10,000 or so.At the time of purchase I kept insisting for a warranty card which the shopkeeper in his hurry to sell the product , told me was packed inside the consignment.He told me that I had to preserve the manual and the receipt which I did.I was never told that I was supposed to fill an application form enclosed inside the consignment which was supposed to be sent to the company for issue of a card which will eventually serve as a permanent warranty for the product.After purchase I handed over the bundle to the contractor for fixing it in the kitchen and the form was never seen by me.The Akbarrallys receipt ink has also disappeared after an year. Now on 28/01/2012 the chimney stopped working and I lodged a complaint at the call centre.The complaint # was 1201280775.A mechanic came from Prompt Services and did servicing of the chimney , charged me service charge of Rs 1500/-.Even though the problem was not fully solved it was working partially and was making noise.He said the problem might get resolved, in case it does not, then a replacement will be required. Now two days back again the chimney stopped working.Again I placed a complaint and told the technician about the problem and he says that if I do not have the card I should pay Rs 4000/-+ for replacement. Now my question here is : as a consumer when I trust Faber Why am I subjected to this ! Firstly when repeatedly I was asking for a Warranty card why I was not informed about the procedure of acquiring the warranty card which I was told today by the technician.And if the sales man at Akbarrallys was too much in a hurry to sell the product why should I suffer?I have already sunk Rs 1500/- and am not in a position to pay again another Rs 4000/+ for repairs.If this is the position then I really regret having purchased a FABER chimney! Plz note there is change in Faber HeatKraft Chimneys Toll Free number its 18002093484 and not 18002903484. Does Faber have an office in Pune any more ? . We need some spares . This is Vedant Jain from Kolkata, India. I had taken a yearly contract from faber for my chimney servicing and am really disappointed. The behavior of the technician is really bad. They barely know how to talk to their customers. They don’t come up at the right time, instead we have to call them and ask to come and do the service. Sometimes, when the chimney is a bit more dirty, they directly charge us double the amount that was told. I had even tried to contact the manager but no attention was paid. I am really disappointed with this contract and in future I would try to avoid buying FABER products because of the poor service. For god sake please do not purchase any Faber products. Very poor service and will not get any customer care nos. I have been trying to talk to them for the last 6 to 7 months. After reading the comments by the customers of FABER, I am surprised, how a company of that standard can be so ignorant about the customer? Will anything really happen to my comments above? Did I waste my time writing these two comments? The top management at FABER should not ignore the customer. I am sure FABER has not gone bankrupt? Why don’t we change our attitude towards the customer? Its high time I wish some thing really happens at FABER. Sir, I had purchased 3 chimneys (90 cms MARS) , a hob (GB 465 SSP Four Burners) and a Franky NEPTUNE F611 30×20 Micro Finish Steel sink from one of your authorized dealer M/s. M.P. & Sons (HUF), BSK 3rd Stage, Bangalore-85 vide Tax Invoice no. 2072 dated 8th March 2010. The carpenter installed the chimneys, hob and the sink during May 2010 after the building was ready. We occupied the house only during July 2010 and were unaware of the owners manual/warranty card. So we could not send the registration form either immediately after purchase as the same is kept inside the box or after installation as the same were misplaced by the carpenter. We regret for the same. We came to know about the life time warranty only when one of our friend purchased a chimney recently. Will you please let me know as to how I can get the above items serviced and also get the Life time warranty benefit? I shall also try to send a mail. correct the toll free number of FABER, it is 1800 209 3484 only. My Faber Chimney is not working and people from FABER, Jaipur are not ready to give response. Isn’t it surprising. A company of world level doesn’t Have good service support. any way good luck to people using FABER. We had contacted the Faber service for the service of my Chimmey.. Little did I know that I had done a blunder buying a Faber product. Inspite of umteen follow up , no person has ever turned up. I think, Faber’s after sales service is the worst in the country. sir, ihad lodged my complain oo toll free no with my complain no.1109185144 dt 12-9-11 but till now i am waiting for rectification of my chimney defect. Pl. look into the matter. i had purchased a faber make chimney. and the front panel of this chimney is in broken condition. i had complained at local (RANCHI) service center,at CAPITOL HILL HOTEL Main road.My complain no. is 238 dt 26-7-11. INSPITE of several reminders but of no use. Then i lodged complain to toll free no having complain no.1109185144 dt 12-9-11 and complain on their Email address on 10, 12,,14 sept’11 along with fax complain on Fax no. 02026930408 but all futile. now iam unable to understand that where i have been trapped.on toll free no it was told that it is not covered in warranty, on that i had assured to make payment of that. BUT, all in vain. Not able to contact any one in chennai. I purchased a Faber Chimney a 15 months back and installed it after 2/3 months and the effective usage of chimney is less than a year. Filter is being cleaned every week with hot water and surf. The motor is not working. No one in the customer care to pick up the call. Any one to bell the CAT????? We are senior citizens, over 60 years of age. We had gone in december 2010 to Mahavir stores, in Santacruze and purchased a faber Perla energy 60 cm. our serial no. is Perla energy TW60 G1010039985 . We were informed that it has a life long guarentee/warranty. in touch with Mr Mahinder of Faber. we have not got a replacement. Your personal Riyazul Khan, phone no. 8879022215 has visited our house and knows about the whole matter. Now, could you kindly look into the matter and oblige, or you too would like to make us run around and give us no other option but to go to the consumer court. this tollfree number (18002334595) does not work. Faber after sales service is worst. My Faber chimney is not working since last 4 months and still i am running behind these guys to get it serviced. While selling the product they make lot of promises like life free warranty, …. but when it actually come to providing service they are worst to respond. What I faced, I don’t want others to face. Plssss do not buy FABER products as they don’t care to respond to customers once their product is sold. Faber Customer Care is the worst. Even to get the technician to check the gas hob takes more than 15 days. Fixing the issues that they only know how much time they will take. Faber Technicians are like GODs whom you’re heard about but difficult to get darshans. People should stop buying Faber products so that these guys become jobless and then only they understand the amount of pain they give to their customers. The chimney is broken and despite calling customer care so many times there has been no response at all…. y do u even sell products when u cannot provide after sale service. Too bad customer care. I had never seen such a callous attitude from a group who had a good reputation. It seems Faber doe s not want to grow else they would not have ignored resolving customer issues. I wish senior management take a look and go for a turnaround in ther strategy. As of the now the situation is too bad and is going for worse. wish good sense dawn on them. I have one complaint number 129124 registerd in Delhi Faber call Center for installation of Chimney.Response is very poor.Proper information is not being provided as to when the representative shall visit. supply the same. kindly give instructions to deliver the 2 nos filter to your service provider. What is th epoint of Lifetime Warranty if the customer is made to wait indefinitely? I bought a Faber Chimney (Mars) in 2006 with Lifetime Warranty (HYD 0832478) and got it installed in October 2007. The Chimney developed some problem in April this year and I lodged a complaint with the service centre at Secunderabad (No. 9136). It took a lot of persuasion to get the technician to take a look at the chimney, which he did on 6 May 2010. He said the motor had to be replaced and promised to get the replacement in 20 days’ time. After waiting for a month, I started telephoning Faber’s Call centre and their service centre at Hyderabad. Finally, after nearly a week of constant telephoning, the same technician arrived, only to pretend that he had brought the wrong motor! He wanted one more week. My patience was wearing thin and my kitchen was getting dirtier by the day, I decided to mail my complaint to Faber’s Customer Care Unit. I sent a mail on 3 June and I was promptly informed that my complaint would be attended to that very day itself. Unfortunately, nothing happened for days and kept calling them and mailing them to remind them about the complaint. The oftener I called, the more callous they grew, often putting my call on hold for several minutes and ignoring my mails.